If you don’t have a regular group of friends to play Anthem with, there’s no need to worry about missing out on the game’s high-level content. 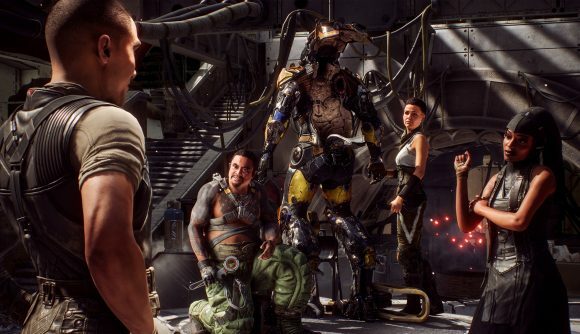 Anthem will feature raid matchmaking, allowing you to easily find other players to run high-level content with. While all Anthem’s story missions can be played solo, you need a group to finish do raids and Strongholds, so easy access to like-minded players is much appreciated. Darrah’s response – caught by VG247 – is a relief, given Anthem’s general similarities to Destiny. Bungie’s loot shooter doesn’t allow proper matchmaking for raids, though the Guided Games system offers a heavily restricted alternative. Bungie’s reluctance to offer raid matchmaking has been due to the difficulty and complexity of those encounters, however – it’s nigh-impossible to clear Destiny’s toughest bits without a group of players effectively communicating and working as a team. Whether Anthem’s raids and Strongholds offer a similar level of complexity remains to be seen, but it’ll be nice to at least have the option of grouping with randos in-game. You definitely won’t be able to clear high-level stuff solo, though, as Darrah says that Strongholds will require groups of four to complete. Darrah adds in another response that “all modes will have matchmaking,” though you’re free to complete any story mission solo. The Anthem release date is set for February 22, preceded by a “VIP demo” for Origin Access members. There are also alphas and betas on the way before then, but we’re still awaiting details on when those will be available.